The set of bracelets are beautiful to show your delicate wrist. Various wearing way for you, all or choose which you like. The set of bracelets have four pieces, each of bracelet is unique. 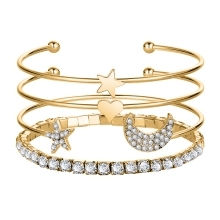 The elements of moon, star and love make these bracelets funny and beautiful. Opening design make the wearing easy. You can wear it all or choose which you like to wear. Nice jewelry to add your charm.